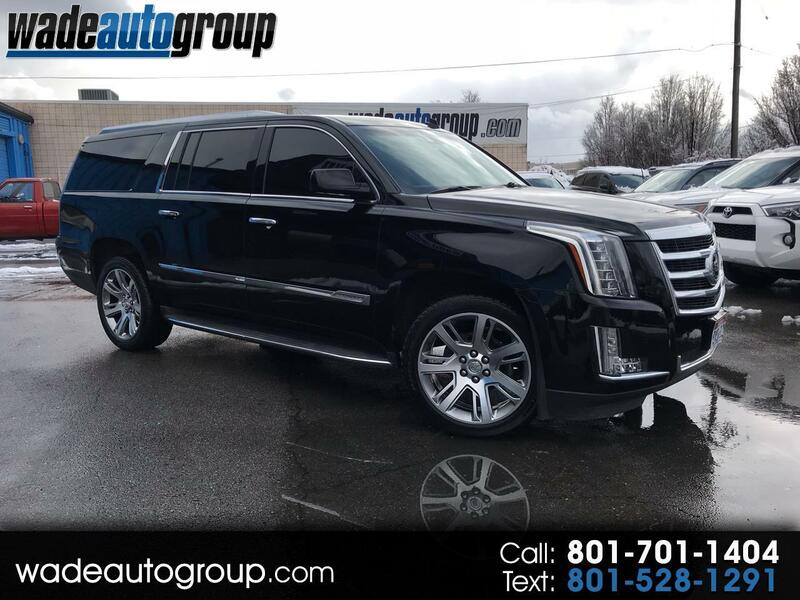 2015 Cadillac Escalade Premium ESV 6.2L V8 AWD- Black W/Black Leather.. Premium Pkg, Factory DVD, 2nd Row Captain Chairs, Navigation, Tow Pkg, Smart Key, Leather Seat Trim, 3rd Row DVD Screen, Adaptive Full-Speed Range Cruise Control, Automatic Safety Belt Tightening, Driver Assist Package, Driver Awareness Package, Electronic Powered Parking Brake, Forward Collision Alert, Front & Rear Automatic Braking, Illuminated Door Handles, IntelliBeam Headlamps, Lane Change Alert, Power Tilt-Sliding Sunroof w/Express-Open/Close, Preferred Equipment Group 1SC, Rear Cross-Traffic Alert, Reconfigurable 4-Color Head-Up Display, Second Row Bucket Seats, Side Blind Zone Alert, Theft-Deterrent Alarm System, Theft-Deterrent Package, VAC Power 17'' Disc Brakes, Vehicle Inclination Sensor, Vehicle Interior Movement Sensor. Here at Wade Auto Group we sell quality vehicles at low prices. This car has a CLEAN TITLE. Call now or visit us at www.wadeautogroup.com WADE AUTO GROUP 12277 South 700 West Draper UT 84020 ''You've got it made with WADE'' WE BUY TRADES.....Extended Warranties available, call for more informatioN.